Disney Princess magazine is the perfect magazine for any little girl! Your daughter will love reading stories, playing games, and making crafts that are all related to her favorite princesses. She will get hours of entertainment from each publication and you will enjoy watching her have so much fun! Order her a discount subscription to Disney Princess magazine today! 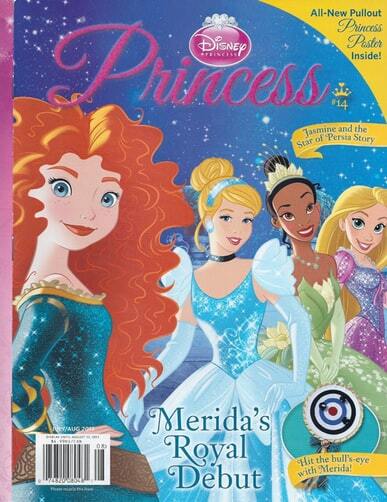 If your daughter loves all the movies with princesses, then she will love this publication about them as well! Each issue of Disney Princess magazine will provide her with many great stories about all of her favorite princesses, including the classic princesses such as Cinderella and Jasmine as well as newer ones like Merida and Elsa. She will enjoy reading new adventures about her favorite characters and the enjoyment that she receives from these stories will help cultivate a life-long love of reading in her. In addition to numerous stories about all of your daughter’s favorite characters, each issue of Disney Princess magazine also has many extras that she will enjoy. Every edition contains a pull out poster, puzzles, themed games, and many other fun activities. Not only will your child enjoy this periodical, but you will enjoy doing the games and puzzles with her as well. This magazine has many great, developmentally appropriate activities for young girls. You and your child will also love all the great craft and snack ideas that are in Disney Princess magazine. There are ideas for fun decorations that your daughter can make for her room or the refrigerator. You will love watching your little one express her creativity through all the great craft and recipe ideas found in each issue of this publication. Young children love working with their hands through crafts or in the kitchen and yours will enjoy the ideas she gets from this subscription. Give your daughter royal entertainment by ordering her a discount Disney Princess magazine subscription today!